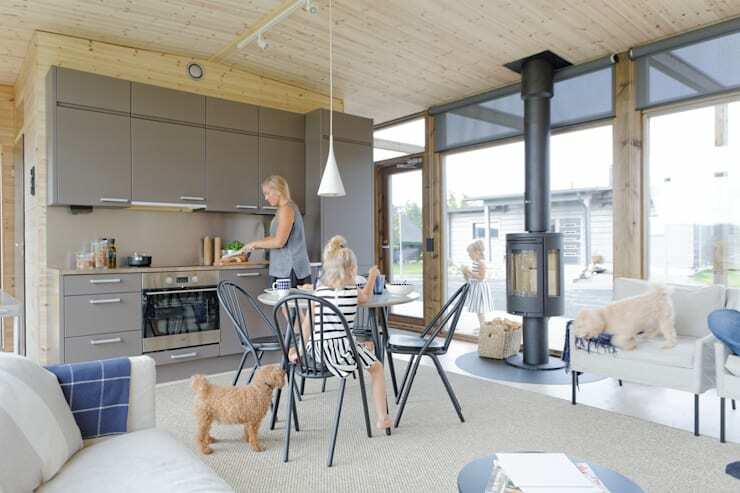 Timber is one of the most enduring construction materials that offers grace, age-defiance, as well as a range of stylistic benefits and options. Today’s feature project, known as The Glass House, provides us with a brilliant example of well-utilised timber, which has created a unique, alluring and remarkable abode. 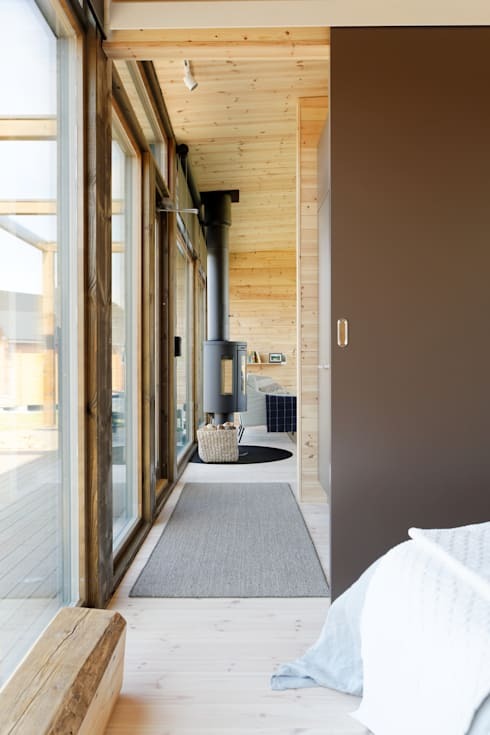 Designed by the team at Woody Holzhaus, this spectacular summerhouse is a modern take on a more traditional log home, with light wooden tones, well-proportioned rooms and an open, contemporary atmosphere. Neither austere nor overwhelming, the décor and interior architecture boasts an open floor plan, perfect for families and those who are seeking a spacious yet cosy ambience. Blurring the borders between the interior and exterior, high quality materials create minimalist charm, as well as a highly charismatic aesthetic. 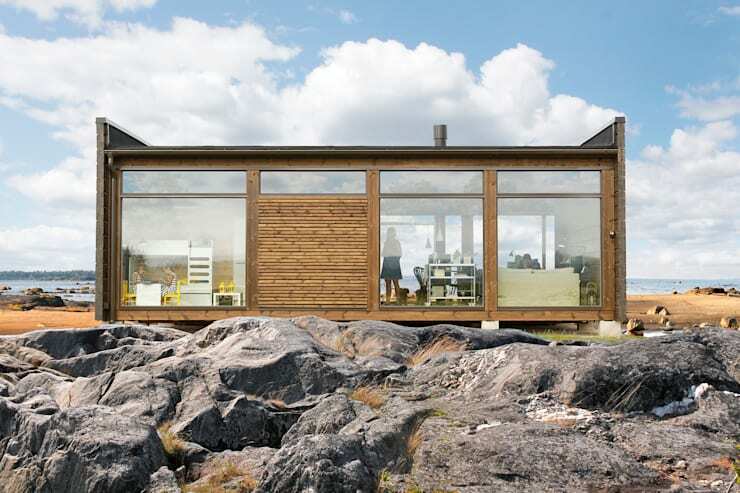 Timeless and unique, you simply must take a tour of this intriguing and gorgeous timber home. Read on below to check it out, and let us know your thoughts in the comments below! Freedom, enchantment and luxury are the take home sentiments of this truly one-of-a-kind abode. As we take our first peek at this dwelling from its rear, we see that it is located quite close to the water. A true holiday dream house, the timber frame structure sits atop concrete footing. 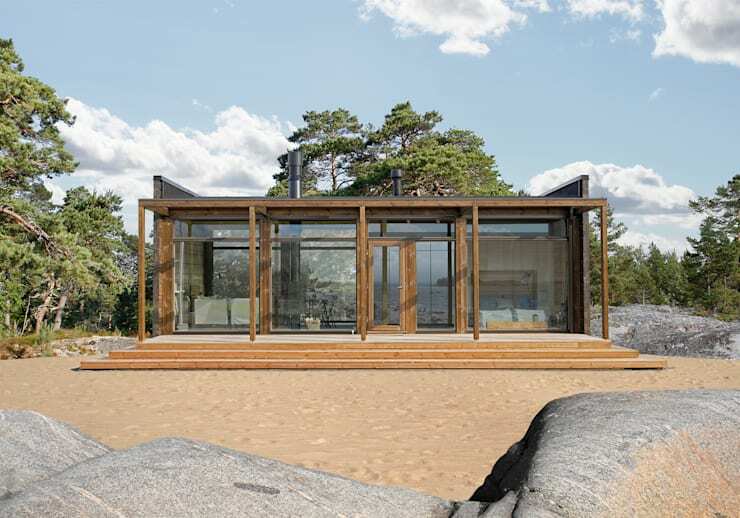 This post-and-pier foundation provides structural integrity for the sand earth that the house rests upon, while additionally protecting it from the weather, and regulating the internal room temperatures. Compact yet replete with plenty of space-saving accessories, this two-bedroom residence is a mere 75 m², yet feels far larger. Designed as a weekend house for a small family, we now view the property from the front, and are able to see that the large glazed sections of wall are continued throughout. 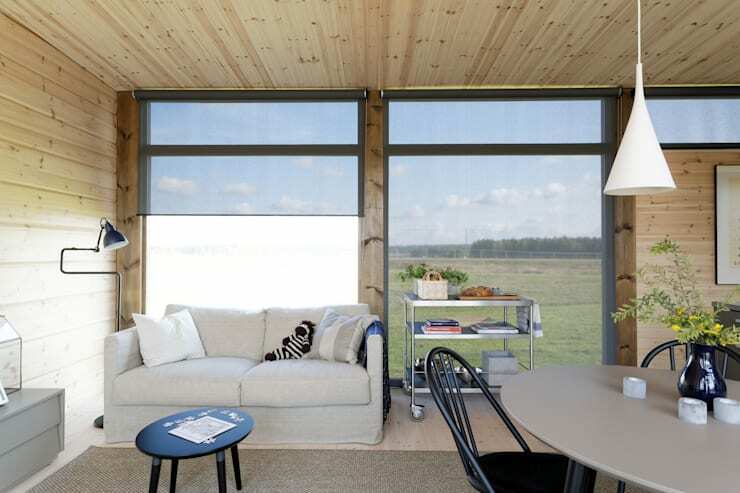 This inevitably fills the interior with ample natural light, and ensures it is enjoyable year round. From this vantage we see that the living room is situated to one side of the house, while the two bedrooms sit opposite. As it enjoys a huge exterior deck, this home would make a brilliant place to entertain, or perhaps an area to simply relax with friends and family and enjoy the seaside. Inside the dwelling, the ambience and atmosphere is one of calm peacefulness, with a restful yet engaged aesthetic. Light tones are added throughout, with internal timer cladding functioning as the ceiling and walls. The furniture is exceptionally chosen for both the home’s situation, as well as its desired aura. Pieces are Nordic, with contrasting hues, focused mainly towards softer sandy tones and neutral shades. Here we take a quick peek from the main bedroom into the living area. Plenty of space-saving inclusions have been incorporated, adding to the functionality of the abode. Sliding doors are one of these and save the occupants from needing to sacrifice floor space to open and shut entranceways. The attention to detail that the designers have employed throughout the home is exceptional. Boasting a chic Scandinavian sense of flair, each room is considered and thoughtful. This seating space is located adjacent the dining room area, and offers space to sit, relax and unwind. 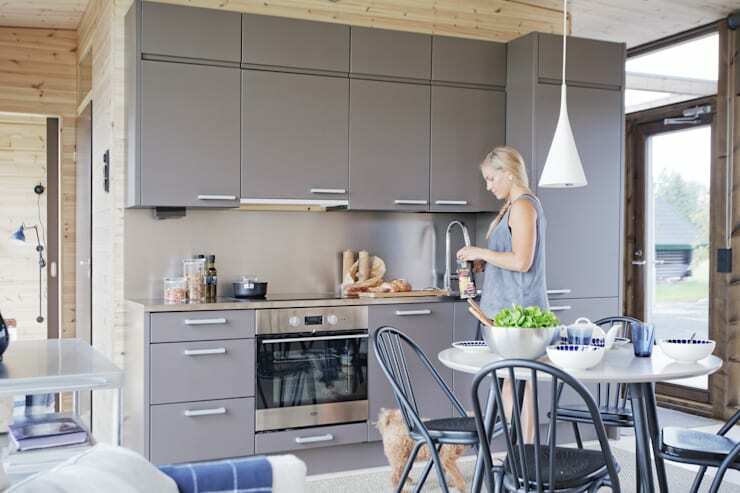 Focusing in on the kitchen for a second, we’re impressed by the neutral colour scheme and the functional yet compact layout of stainless steel appliances. A stainless steel splashback has also been included, and boosts the setup’s usability. Ample cupboards have been installed, and their grey hue perfectly complements the surrounding timber tones. Would you like to live in a home like The Glass House?